A well-known independent school has won £25m in government funding to provide an academy for children - many of whom will be from military families. Wellington College is to sponsor the 1,150-pupil Wellington Academy near Andover, Hampshire, to be built on the site of a former state school. Up to 40% of pupils could be children of military personnel as the school will be near several Army bases. A commanding officer from the local garrison will be on the governing body. 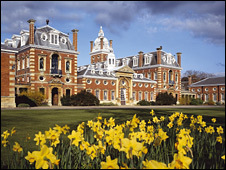 Wellington College, in Berkshire, is investing £2m, which has been put up by two former pupils. The school, on the site of Castledown Foundation School, will imitate Wellington College's own house system and will offer places for boarders as well as day pupils. The Department for Children, Schools and Families said it was hoped that a significant proportion of boarding places would be taken by Army personnel, subject to discussions with the Ministry of Defence. The spokesman said many children of Army officers were offered highly subsidised places at good independent schools. It was hoped that through the new academy, similar opportunities would be offered to those of rank and file soldiers, he said. Master of Wellington College, Dr Anthony Seldon, said the new academy would draw on the school's military tradition. The school is named after Battle of Waterloo victor, the Duke of Wellington, and seeks to produce future leaders. It charges up to £8,540 a term. The new academy would have a strong emphasis on leadership, high academic achievement and an all-round education, Dr Seldon said. But he added: "The main aim is to give a quality education to these people who can't afford to pay fees." "What we are trying to do is model it very closely on Wellington College which is one of the world's most famous independent schools," Dr Seldon added. Wellington College already has strong links with the state sector and works closely with several local schools. Dr Seldon said he believed all independent schools should do the same. "We could have 100 independent schools starting these academies by 2010," he said. Schools minister Lord Adonis said the project was a ground-breaking one. He added: "We intend the academy to be a model of private-state partnership in education, and I hope it will encourage other leading independent schools to become similarly engaged in the academy programme."